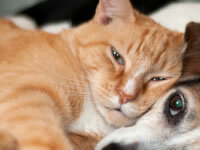 Diabetes occurs less frequently in cats than in dogs. However, when it does occur, feline diabetes can be more difficult to regulate. When a diabetic cat ingests glucose and can't process it properly, it leads to the build up of sugars in the blood stream. Eventually, the blood sugar gets so high that sugar begins to be spilled in the cat's urine. Both the high blood sugar and the loss of sugar through the urine can have severe, and sometimes life threatening, consequences. Diabetes can occur in cats of any age, though most are over six-years old. Some cats can be insulin dependent and can be helped by life-long insulin therapy. Other cats can be non-insulin dependent and only require insulin when stressed. Typically, these cats regain their balance once the stressful event is over. The common signs of diabetes are increased thirst and urination, along with increased appetite and weight loss. However, these signs can be masked in cats that have other illnesses. These symptoms can appear suddenly, over a few days, or over several months. In many cases, cats that have diabetes can be difficult to diagnose because they also have a concurrent illness or disease that can mimic diabetes. Some of these diseases are hyperthyroidism, kidney disease or failure, adrenal gland disease, gastrointestinal disease, cancer, liver disease or failure, and some types of drug treatment. Fasting blood-sugar level: Test results that show a blood-sugar level over 200 indicate the possibility of diabetes. However, stress alone can result higher blood-sugar levels (up to 300 to 400) in cats without diabetes, attributed to a surge of released adrenaline. Urine glucose: Diabetic cats have sugar in their urine. They can also have ketones in their urine, which results from a defective fatty acid metabolism. Cats without diabetes that are under stress may also have some glucose in the urine, but it is temporary. Blood chemistries: Lipemia, which is increased fat in the blood can be evidence of liver dysfunctions. Urinalysis: In addition to sugar and possible ketones, there may be signs of bladder infections. Insulin injections are still the most accepted means of treating insulin-dependent diabetic cats. Initially, a diabetic cat is hospitalized and regulated for three to four days. During that time, multiple blood sugar tests are given to establish a proper schedule for the cat. The goal of treatment is to maintain a blood-sugar level between 100 and 200 during each 24-hour period and to improve or eliminate any symptoms. Often, numerous hospitalizations for serial blood sugars are required for monitoring and making adjustments in insulin dosages. Feline eating habits. Ideally, diabetic cats should be fed two to four times per day. Since most cats are fed by free choice, it can be hard to change them to interval feeding. Also, some cats will only eat one type of food, making it hard to change to a new diet. Transient diabetes. Some diabetic cats may spontaneously lose the need for insulin after years of treatment. Failure to perform serial glucose tests. Basing treatment on one random glucose test is considered a hit-or-miss approach, and is usually more time consuming and expensive than doing serial tests. It can also cause wide fluctuations in blood sugar levels. Improper blood-sugar monitoring Prolonged or frequent boarding of the cat Hormonal influences. Blood sugar can be controlled more easily in a spayed or neutered cat.